There are two types of IP addresses – public and private. Public IPs are used by routers and by computers connected directly to DSL modems without a router. Private IP addresses are special IP addresses that are known only to a router and its home network. A Web server will not deliver Internet data to a private IP address. It will deliver the data to the router (which has a public IP address) and then the router will deliver the data to the computer that has the private IP address. Routers are special because they have two IP addresses. An IP address is assigned to each of the router’s two “interfaces”. The first router interface is called the WAN (Wide Area Network) interface. This is the side of the router that faces the Internet and has a public IP address. The second router interface is called the LAN (Local Area Network) interface. This is the side of the router that faces the home network’s computers and has a private IP address. One of the primary jobs of a router is to assign IP addresses to the computers on a home network. The router has a “pool” of IP addresses that it keeps track of. When a computer connects to it and asks for an IP address, the router picks an IP address from the pool and assigns it to the computer. The router makes sure that two computers are not assigned the same IP address. 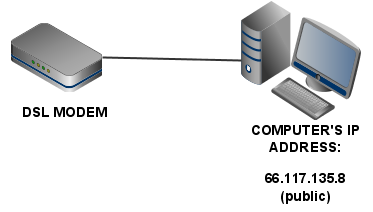 This process of computers asking for an IP address from the router is called “dynamic” IP address assignment. It uses a network protocol called DHCP (Dynamic Host Configuration Protocol). After the computer has used an IP address and has disconnected from the router, the address can be put back into the pool of available IP addresses. The next time the computer asks for an IP address, it might get the same IP that the router assigned to it before, or it might get a different one. When the router keeps track of IP address assignments, that means that a human does not have to do it. It saves time and it’s more accurate. It also means that you do not have to configure your computer’s IP address manually. Computers are set by default to ask for an IP address dynamically. The opposite of a dynamically assigned IP address is a static IP address. A static IP address has to be manually configured on the device that is going to use it. If you are connecting only one computer to your DSL modem, it will use the static IP address that comes with your DSL service (please see the instruction sheet in your DSL kit for which IP address you have been assigned). You will configure your computer to use that IP address for as long as you have the DSL service. The static IP address you will be assigned will be a public IP address, which means that data can be sent directly to your computer. This setup has security implications. If you have a static IP address and you do not have a device called a “firewall”, your computer is more vulnerable to hackers. A firewall examines the Internet traffic and decides if the traffic is good or bad. It can protect your computer from dangerous Internet traffic and hackers. It’s a good idea to use a router even if you only want to connect one computer to the Internet, because a router will have a built in firewall. A router will generally use a static IP address for its WAN interface (the side of the router that faces the Internet). That means that the router does have to be manually configured with that address. This is something that LMi.net can do for you, or you can do it yourself. It only takes a few minutes to configure a static IP address into a router.